There's honestly too much gluten free food in my house when I come home. The cupboards are bursting with snacks -- chips, cookies, popcorn; you name it it's in my cupboard here at home. The cupboards aren't the only area that is full with gluten free goodies as the countertops are overflowing with freshly baked brownies, cookies, cakes... again, anything you can imagine. It's hard on my waistline, but a great opportunity to try new products out. 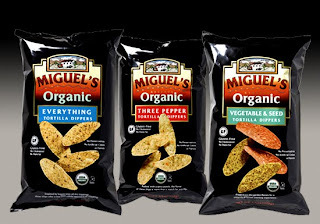 One such product is Miguel's Organic Tortilla Dippers. They come in three different flavors: Vegetable & Seed, Three Pepper, and Everything. I tried the Vegetable & Seed flavor and I was instantly enamored with it. My family and I matched the chips with a fresh salsa made by one of my mother's friends and the combination was an enormous hit; the bag of chips was gone within an hour. We normally eat the Garden of Eatin's Blue Chips, but Miguel's are a great change of pace with a bit more flavor.